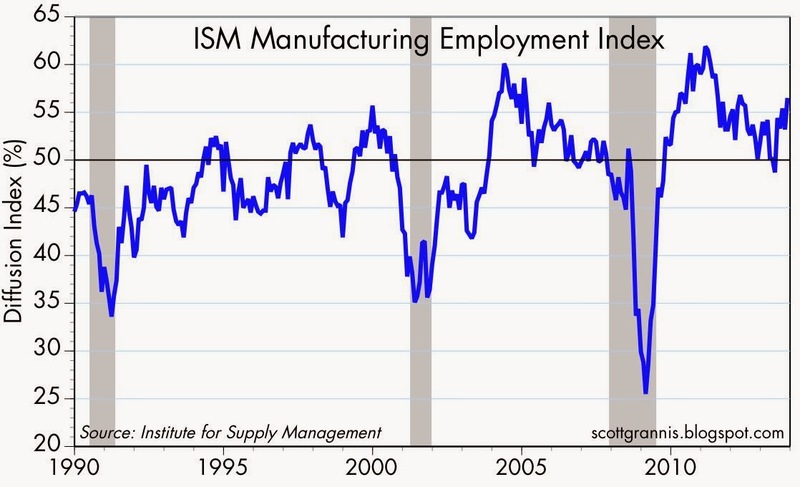 The November ISM manufacturing survey handily beat expectations (57.3 vs. 55.1), posting its strongest reading in over two years. This suggests that the prevailing consensus of economists, which expects GDP growth to be slower this quarter than last quarter, is too pessimistic. The relationship between the ISM survey and quarterly economic growth, shown in the chart above, has not been as tight in recent years as it has been in the past (particularly in the 1990s), but the recent rise of the index at the very least suggests that it is unlikely that the economy has slowed in the current quarter—that growth should be at least 2.5% if not more. 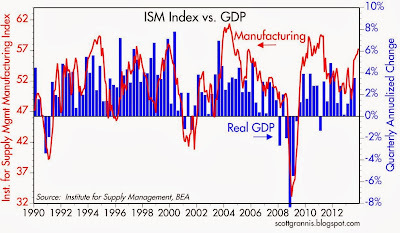 UPDATE: I've updated the chart above to reflect the stronger GDP growth reported for Q3/13 (3.5% vs. 2.8% originally). 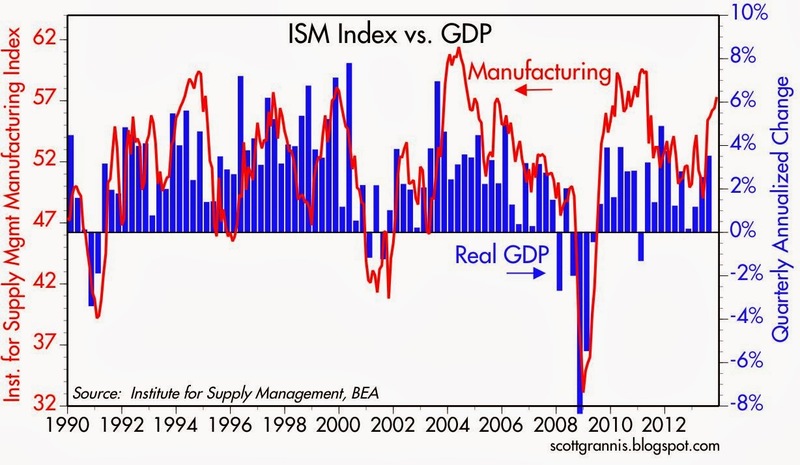 This puts GDP growth more in line with the ISM survey. 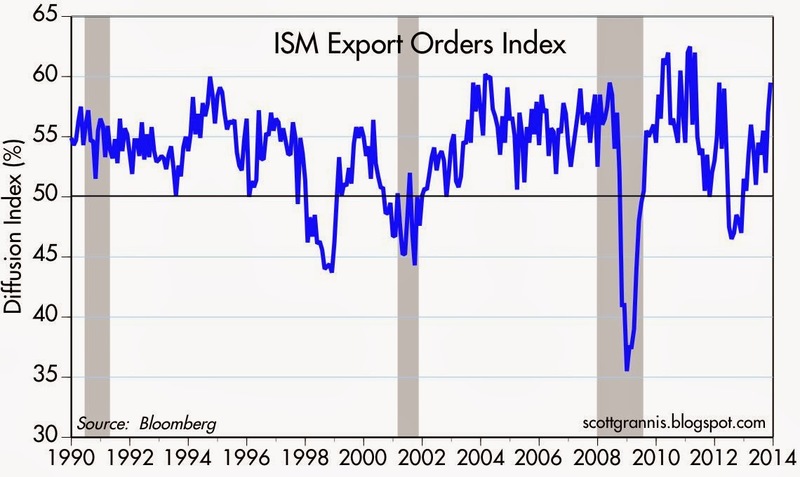 The export orders component of the ISM index, shown above, was particularly strong, and suggests that global economic fundamentals are firming. This is an unalloyed good thing for everyone. 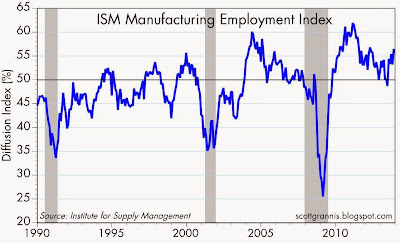 A pickup in the employment component, shown above, suggests that firms' confidence in and expectations of future conditions have improved somewhat. It's been a lack of confidence that has kept many firms from reinvesting record-setting profits, so this is very encouraging. 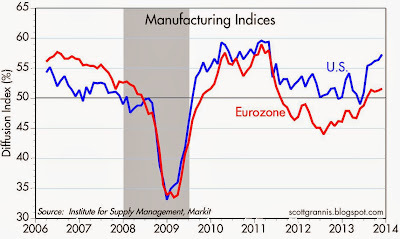 Manufacturing conditions in the Eurozone have improved over the past year, as the region has emerged from a two-year recession, but the Eurozone economy is still lagging that of the U.S. That same reality is reflected in the equity markets of both regions, as shown in the second chart above, with Eurozone equity prices rising but lagging significantly those of the U.S. Further, this suggests that it's not QE that is boosting stocks, but rather a gradual improvement in the underlying economic fundamentals. 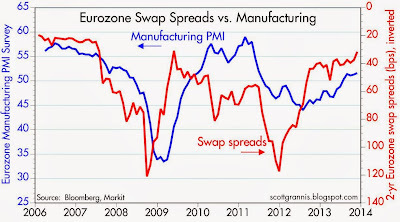 The chart above compares Eurozone swap spreads (red, inverted) with the Markit manufacturing survey. 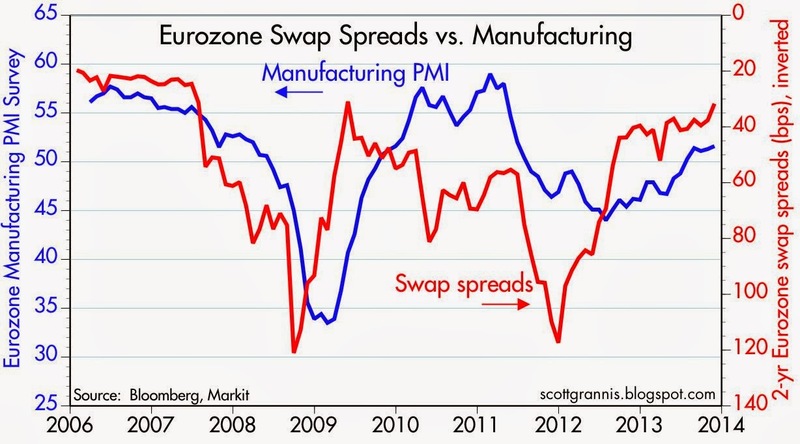 If swap spreads continue to be a good leading indicator of overall economic and financial market health, as the chart suggests, then we should see more, albeit gradual, improvement in the Eurozone economy in the months to come. That would be a very welcome development. Remember Jimmy Carter? The Mush-wimp? Scott, what do you think about bitcoin? Could you post on that? 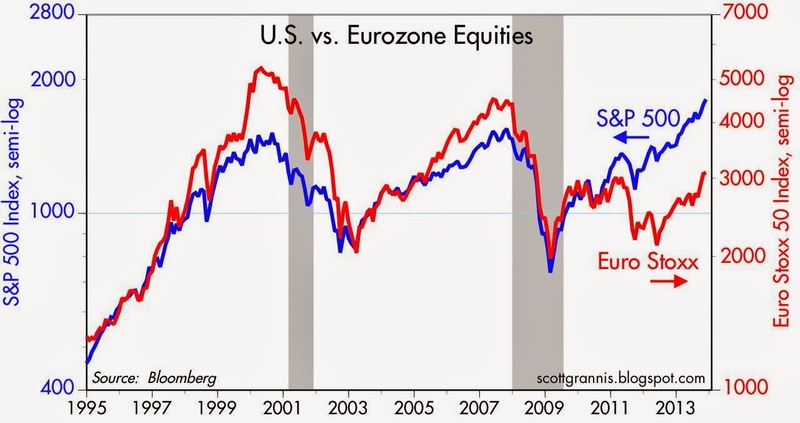 I relate that you are looking in the rear view mirror, when you relate: "If swap spreads continue to be a good leading indicator of overall economic and financial market health, as the chart suggests, then we should see more, albeit gradual, improvement in the Eurozone economy in the months to come. That would be a very welcome development. Liberalism’s bull market turned to a bear market. On Monday December 2, 2013, liberalism's greatest ever fiat wealth rally came to an end, as bond vigilantes called the Interest Rate on the US Ten Year Note, ^TNX, to 2.80%. 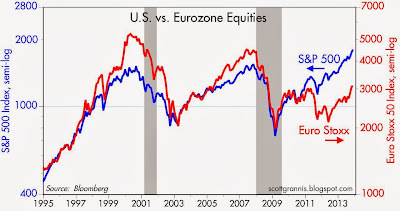 Riskless investing, that came through the money printing operations of the US Federal Reserve and other world central banks, finally came to an end on the death of fiat money, that is as Credit, AGG, and Major World Currencies, such as the Australian Dollar, FXA, and Emerging Market Currencies, CEW, such as the Brazilian Real, BZF, continued lower in value. 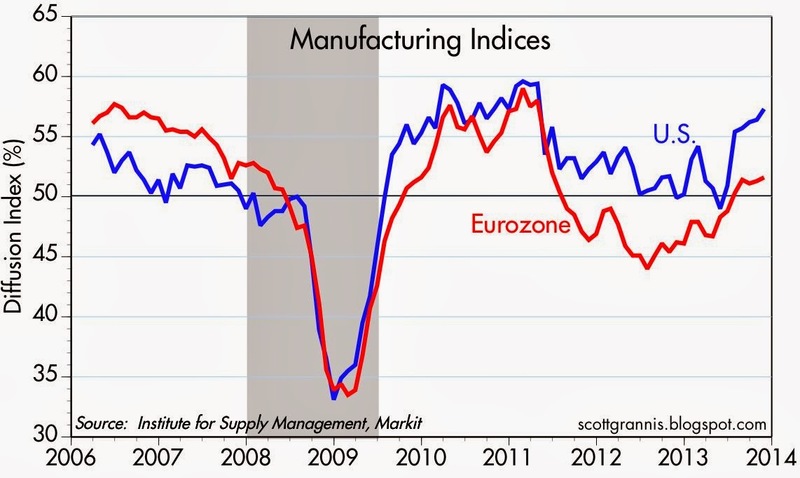 The global industrial Global Industrial Producers, which turned lower on October 23, 2013, when the bond vigilantes called the Interest Rate on the US Ten Year Note, ^TNX, higher from 2.48%, led the way lower: Industrial Miners, PICK, -1.0, Steel Manufacturers, SLX, -1.0, Design, Build, and Construct, FLM, -0.9, Metal Manufacturing, XME, -0.9, Automobiles, CARZ, -0.9, and Wood Production, WOOD, -0.3.